If not made permanent, on December 31, 2014 the Protecting Tenants at Foreclosure Act (PTFA) will expire, leaving renters living in foreclosed properties vulnerable. Without the protection of the PTFA, renters could have no idea their landlord has defaulted on their mortgage and could come home from work one day to find the locks changed and their belongings on the street. At a Congressional briefing held last week, speakers praising the PTFA’s effectiveness in protecting innocent renters included Tristia Bauman and Jeremy Rosen from the National Law Center on Homelessness and Poverty (NLCHP), Matt Hill from the Public Justice Center, and Sham Manglik from the National Low Income Housing Coalition. Representative Keith Ellison, who sponsored the bill, H.R. 3543, that would make the PTFA permanent and add a private right of action also spoke (Senator Richard Blumenthal who sponsored the Senate companion bill, S. 1761 was unable to attend). 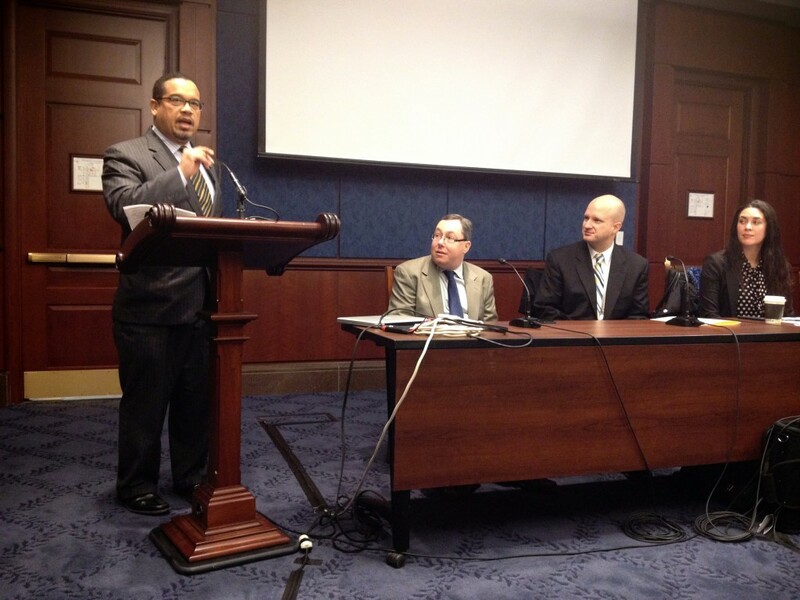 Representative Ellison speaks about the importance of making the PTFA permanent. Since the beginning of the foreclosure crisis, millions of people, including renters, have lost their homes. Before 2009, when the PTFA was enacted, thousands of innocent renters often received threats of being criminally charged for trespassing if they didn’t move out within 24 hours, or could find themselves evicted despite never having received notice that their landlord was in default. The PTFA gives tenants the right to stay in their homes for the duration of their lease agreement despite the property’s foreclosure or, if a tenant has a short term lease or no lease, for a minimum of 90 days’ notice. Although the law has been successful in stemming the tide of wrongful evictions, several of the speakers noted that compliance remains a challenge, and the new bills before Congress would create a private right of action. The PTFA protects renters’ security of tenure in their homes, an essential feature of the human right to housing as recognized under international law. After the enactment of the PTFA, 23 states enacted similar protections at the state level, but that leaves the majority of states without a state-level equivalent. If the PTFA is not made permanent, it is unclear what will happen to tenants living in foreclosed properties, but many may face eviction and homelessness despite paying their rent and complying with their leases. For more information, see the Law Center’s detailed report, Eviction (Without) Notice: Renters and the Foreclosure Crisis, which reviews the impacts of foreclosure on renters, protections for tenants in foreclosure at the state level, and describes ongoing violations of the PTFA. This entry was posted in Housing and tagged PTFA. Bookmark the permalink.